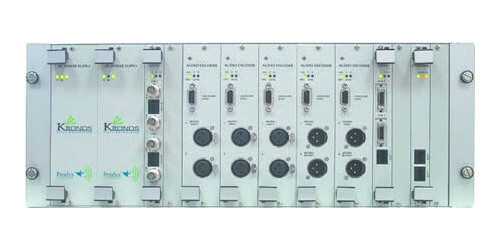 A multiplexer system that can carry voice, high quality audio, video and data channels. 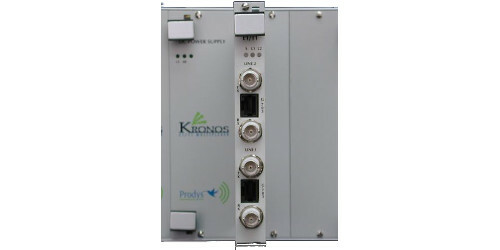 The Kronos multiplexer supports up to four E1 or T1 links – four E1 links can be aggregated to give a total 8Mbps capacity. It is possible to drop/insert time slots across any of the connected E1 circuits. It also supports drop/insert of the 64Kbps time slots in any of the connected E1 circuits. Hot swap modules and redundant power supplies are also supported. Modular 4RU, 19” width rack. Ability to connect up to four E1/T1 circuits to one base device. Drop/insert across any of the connected E1/T1 circuits. AC or DC (48V) power supply. Hot swapping of modules to make servicing and updating easier. Option to extend the configuration with additional racks (up to a maximum of 8 racks). Ability to assigning time-slots for IP traffic dynamically. Routed interconnection of LAN through E1 circuits. Local or remote control and configuration through RS232 (Telnet) or LAN interface (SNMP). Bi-directional module of synchronous data (two ports per module). The interface can be configured V35/X21 and as DTE or DCE. Up to 4 E1 or T1 Multiplexed modules with drop insert and automatic failover capabilities. Totally configurable audio modules by software: selection of analog or digital interface as well as encoding/decoding algorithm..
X21 module for synchronous data transmission N x 64 Kbps. Encoder/decoder modules with analog and digital AES/EBU audio inputs and outputs and auxiliary data. Extension module to cascade up to 15 base devices. ISO MPEG Layer II (mono/stereo). ISO MPEG Layer III (mono/stereo). APTX (Audio Processing Technology) option. AC POWER SUPPLY MODULE 230V. DC REDUNDANT POWER SUPPLY 48V. E1 circuits are full-duplex with 2Mbps capacity in each direction. The E1 module supports mux/de-mux signals over this 2Mbps circuit. Up to two interfaces per module for the connection ot two E1 links (2 Mbps each). To manage the system. Route IP, up to 20 time slots can be allocated. To work as an additional input/output synchronous data module. Asynchronous port for connecting a VT-100 compatible terminal to configure the multiplexer. This module is also a router for direct LAN connection to configure the multiplexer using TCP/IP protocol (Telnet or SNMP). This module configures and controls input/output modules. It facilitates switching between PCM buses and E1 links according to the slots assigned by the user. The Multiplexer always keeps one slot of the E1 link reserved for the control module in order to manage the remote multiplexers. The control module monitors the system state and reports back to the management software. Maintains systems configuration information for automatic re-initialisation. Allows synchronous transmission of data at N x 64Kbps. Free assignment of the number of slots. Provides two WAN V24/V35 interfaces. Provides four ports, each one supporting up to 9.6Kbps. Bit Rate: – One or two channels of 0 to 19.2Kbps each one. Four channels of 9.6Kbps each one. J42 192Kbps for mono signals – 7.5kHz frequency response. J57 for AES/EBU signal transmission. MODES: mono, stereo, dual and Joint Stereo. Sample frequency: 16, 24, 32 and 48kHz. Bit rates: 64, 128, 192, 256, 384Kbps. Auxiliary data with audio working in MPEG. Up to two independent mono channels per module. High Quality voice 7kHz-frequency response-bit rate 64Kbps. Up to two independent channels per module. Voice module, A-law, 3.4kHz frequency response. Sample frequency: 16, 32 y 48kHz. Bit rates: 64, 128, 192, 256, 320, 384 o 576Kbps. Auxiliary data with audio working in Apt-X. Interfaces: 2 XLR male. Selection between analog or digital input. DB9 for auxiliary data..
16, 24, 32 and 48kHz. This module is for cascading up to 15 base devices. Prodys, PCNet. PC Audio Codec Software. Ikusnet2 BP A Portable HD Video & Audio Codec for IP & 3G/4G. NewQuantum Lite Handheld audio IP codec with 3G/4G bonding capabilities - taking the task in hand!